Posted on March 15, 2017 by Sabrina C.
This chilling, nightmare-filled story takes place when seven fans of the famous horror film director, Justin Blake, enter an online contest. They are required to write about their worst nightmare, and the winners get the chance to stay at his legendary B&B, Dark House, featured in his movies. The fans also get to meet the famous man and sneak a look at his upcoming movie. Delighted to find they have won, the horror hopefuls, Ivy, Parker, Shayla, Frankie, Garth, Natalie, and Taylor, set out to have the scare of their life. Spending a weekend in the Dark House appeals to most of them like a vacation home, filled with effects that make the house really seem haunted and mysterious. However, their fun and games take a twisted turn when they are taken to an abandoned amusement park. Embodying the spirit of Blake’s movies, the park is like his own movie set with his wildly creepy characters running around. The seven lucky winners discover they must face their worst nightmares and survive them if they want to be set free. This book grabbed my attention right from the start. It’s description of horror and thrill left me wondering about my own nightmares. I knew I sure wouldn’t last one night in that house, not with its scare tactics and lonely halls. Stolarz uses her characters’ different perspectives to create this nail-biting world. As a big fan of horror stories, I was really anxious to see how the ending wrapped everything up. I have to say I was a little disappointed that I was left with so many unanswered questions, but overall the plot line was very intriguing. I encourage readers who like to be scared to give this book a try. I know some horror stories are a gamble because it doesn’t end the way the readers hope. But Welcome to the Dark House is definitely one of my favorites and I would love to read it again. Welcome to the Dark House by Laurie Faria Stolarz is available for checkout from the Mission Viejo Library. This entry was posted in Book Reviews and tagged amusement parks, art imitates life, horror, suspense by Sabrina C.. Bookmark the permalink. I’m definitely going to be looking for this when I go to the library again! I love “chilling” stories. Thanks for this cool blog. 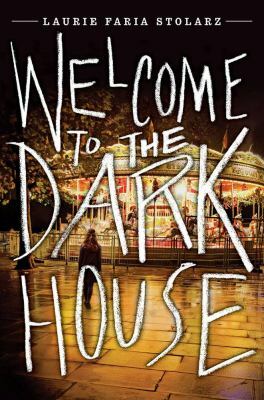 I’m looking forward to reading Welcome to the Dark House. Sounds amazing! I love horror, and cannot wait to check it out!